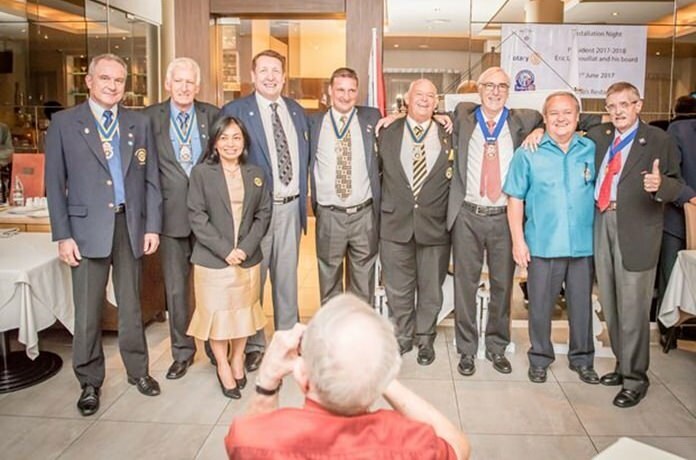 PDG Premprecha Dibbayawan installs Eric Labouillat as President of his club. 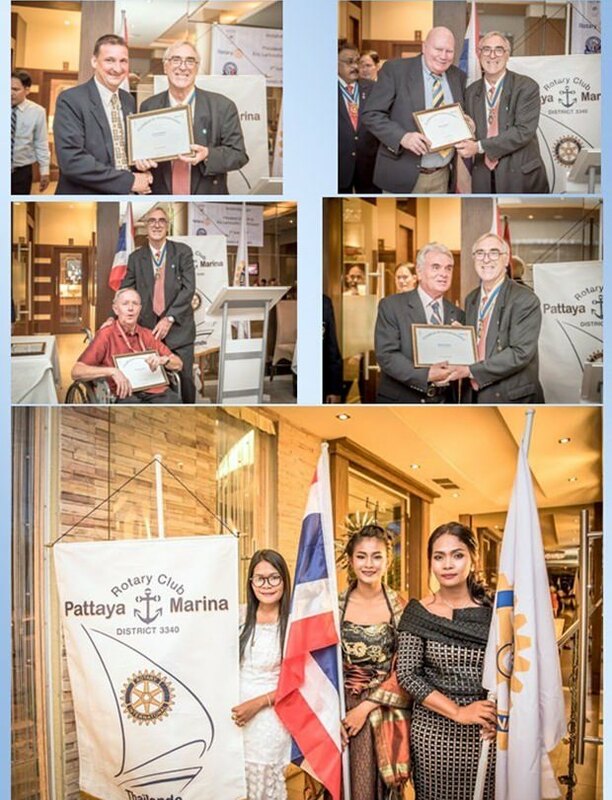 The Rotary Club of Pattaya Marina installed Eric Larbouillat president for the third time at its annual installation dinner. 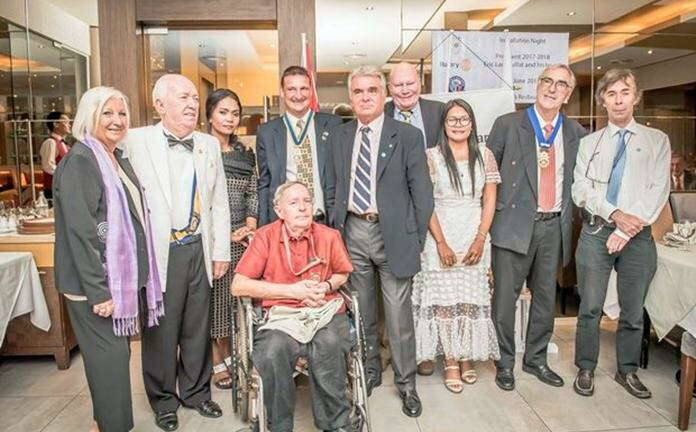 Speaking at the June 3 meeting at Bruno’s restaurant, the repeat president of the French-speaking club praised the work of his predecessor, Michel Roche, who he said guided the club with “wisdom, diplomacy and determination”. 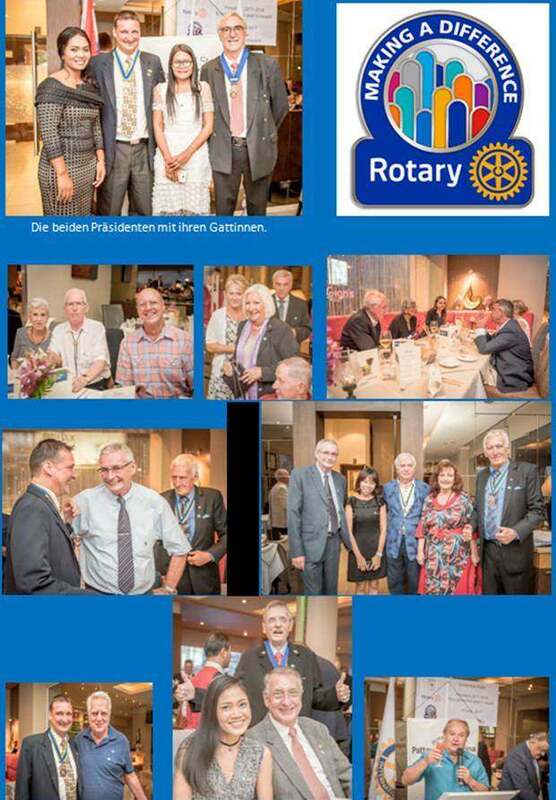 Larbouillat also touched on Rotary International’s 2017-18 theme, “Rotary: Making a Difference”, saying it should inspire members. Roche echoed that sentiment in his farewell speech, asking fellow Rotarians to follow the Rotary idea. He thanked all those who helped him during his year as president and pointed out that many projects were completed, such as the Karen project, which began in 2008 and provides hill-tribe villages with drinking water. 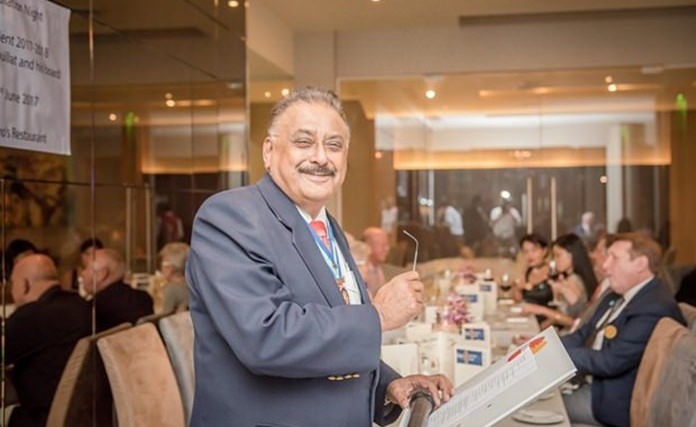 Once again, Past District Governor of Rotary district 3340 Pratheep Malhotra emceed the event. 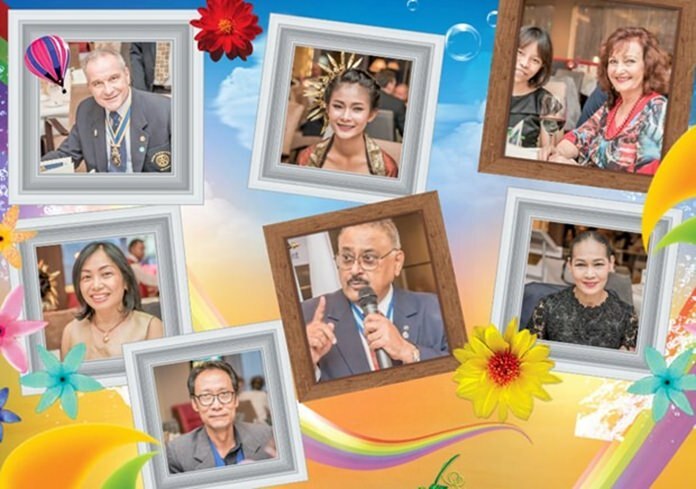 He told guests that HM the late King Bhumibol Adulyadej was the patron of the Rotary movement in Thailand, going on to recount memorable stories about the beloved monarch. PDG Peter Malhotra, MC extraordinaire. 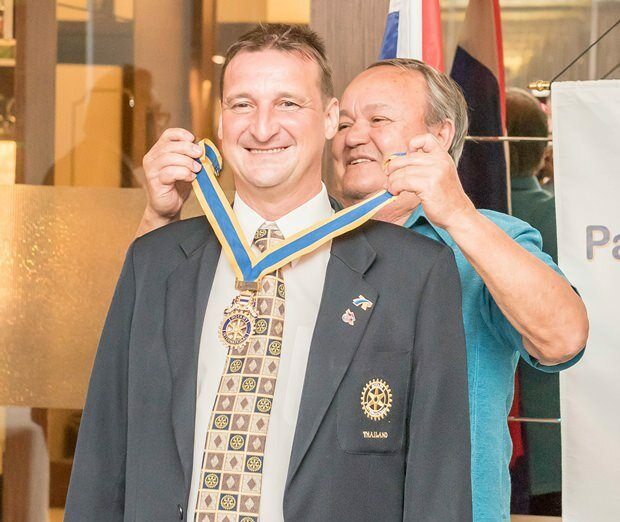 Past District Governor Premprecha Dibbayawan formally installed the new president by placing the chain around Larbouillat’s neck. Two more members, Luccia Lasckar and Patrick Bonnet, were inducted as members and Olivier Gachoud received the Paul Harris fellow recognition. President Eric Labouillat presents his board of directors. 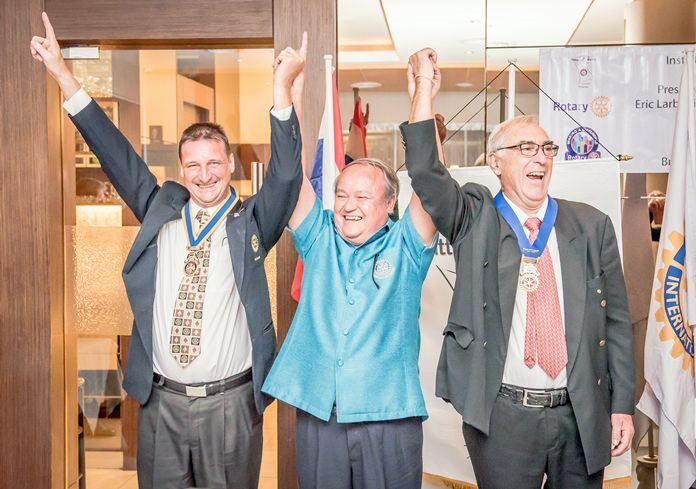 Premprecha Dibbayawan (center) with the new president Eric Labouillat (left) and the outgoing president Michel Roche (right).